I’m a graphic designer from the Grand Rapids, Michigan, area. I currently work as a book interior designer and typesetter for Baker Publishing Group. I love books, and I love my job! 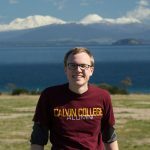 I am a proud graduate of Calvin College. While I was at Calvin, I spent 4 months on a semester abroad in York, England, in the spring of 2010. In the fall of 2015, I visited New Zealand with my siblings. In my free time I love to read, bike, go for walks, travel, and spend time in nature with my camera.